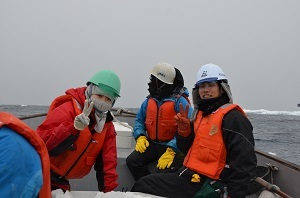 "The Antarctic - Fieldwork - Teamwork"
We interviewed Motoha Ojima, a fourth-year student in the Department of Polar Science, Five-Year Consecutive Doctoral Course. She does fieldwork in the Antarctic. 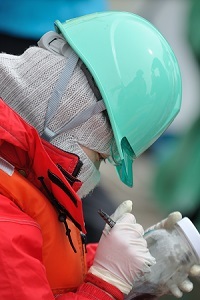 She went to the Antarctic Sea for research at the beginning of this year as well. We interviewed her about her research life, hearing that her motto during her fieldwork is 'safety first, and stay healthy'. Q: What made you choose SOKENDAI? A: In my undergraduate years, I studied zooplanktons of the Antarctic at Tokyo University of Marine Science and Technology. When I consulted an advisor about my intention to study in a graduate program, I was advised that the National Institute of Polar Research (NIPR) was accepting students. So I visited the faculty there, and they told me about many interesting things. I decided to take the SOKENDAI entrance examination as I thought that I would be able to engage in highly specialized research at NIPR where there are front-line researchers working. A: I am studying zooplanktons living in the Antarctic Ocean around Antarctica, particularly where the seasonal prevalence* of ice is present. Zooplanktons are the secondary producers in the marine ecosystem, and they connect the phytoplanktons that are the primary producers and the fish, squid, sea birds and whales that are higher-order consumers. Therefore, I think that accumulating basic data on their distribution and life history is essential to understand the marine ecosystem. The research method is to label zooplanktons I collect from the ocean by their forms. I then obtain data of what varieties and population sizes of planktons live in what kind of environments, and clarify their distributions. Lately, I also study distributions of microorganisms in ice, by collecting pieces of ice floating on the ocean using a catch net from a small boat. What is the sea ice characteristic to the polar region environment for the living creatures there; a cradle or a gravesite? That is what I find very interesting. 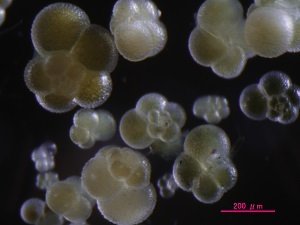 By verifying what kind of environmental factors decide the distributions of zooplanktons, I hope to reveal the way marine life survives in, for human beings, extreme environments. My research subject ? 'plankton' ? comes from the same word as 'planet' ? the earth. Through the ecological research on the planktons, the backseat players of marine ecosystems, I am hoping to feel the dynamism of the large-scale living organism that is the Polar Regions, and the planet Earth. Q: Tell us about the benefits of the Department of Polar Region Science at SOKENDAI. A: In the Department of Polar Region Science, there is no laboratory system, and it is divided into four groups: living organisms, earth sphere, space, and air and water. For instance, there are researchers who study a wide range of areas such as animals or plants, rocks and meteorites, atmosphere and oceans. So, even in the same group, there are various research fields. In the Biosphere group I belong to, the research fields are quite diversified, including seals (large mammals), rhinoceros auklets (birds), and moss (plants). Having researchers who are studying other fields around is stimulating. I think it gives you a perspective of looking at one field of polar science from multiple angles. It is also beneficial to be able to have cross-disciplinary talks, as there are researchers in all kinds of fields. Also, we receive frequent visits of students and researchers from other institutes including from overseas, and there are ample opportunities to interact with people from various research institutes and such. Q: Are there things you are careful about during your field works? A: Safety is the number one priority. You have to avoid having someone injured, or yourself as well. So, I have to take good care of myself, and I also try not to forget to be considerate to others. As an example, on the ship, regardless of whether it relates to your research or not, we conduct observations cooperatively. So I think teamwork is also important. Q: Will you give some advice to those who intend to join the Department of Polar Science? A: The Department of Polar Science offers you an environment in which you can pursue your specialized field, and it also allows you to think about the earth, life from multiple perspectives. It is a multidisciplinary research institute where people of various fields are trying to find solutions with the keywords of Polar Regions and the Earth. If you are seeking romance in nature, and want to find the answers yourself, NIPR is an ideal place. Those who want to find answers no matter what should join the Department of Polar Science of SOKENDAI. On research. The white part in the back is sea ice. Although it must not be easy to conduct fieldwork in harsh environment sas a woman, her way of talking gaily and happily left a strong impression on me. Having talked with her, I was reminded of the importance of teamwork in fieldwork. As well as the context of fieldwork, NIPR receives visits of many researchers from other institutes and universities. I rediscovered that the Department of Polar Science is a place that enables you not only to pursue highly specialized research, but also to feel ties with other people strongly. Graduated from the Department of Marine Biosciences, Faculty of Marin Science, Tokyo University of Marine Science and Technology in March, 2011. Entered the doctoral course of the Graduate University for Advanced Studies in April, 2011. 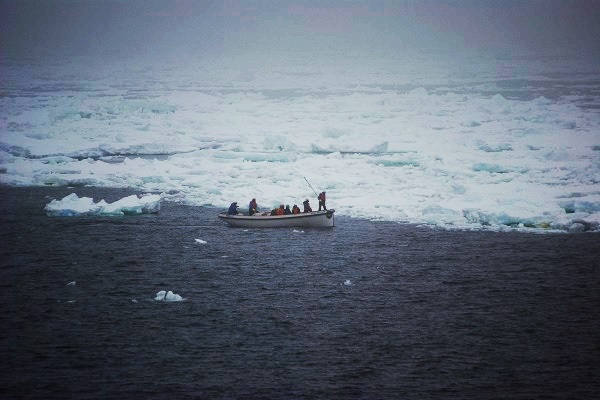 She received the Aota Masaaki Award 2014, The 29th International Symposium on Okhotsk Sea & Sea Ice. Title: "Sea ice may be a direct food source for fish"